Product Group: Ash Tray Products Concerts Festivals Eco Friendly Ideas Exhibition Giveaways Olympics Pocket Gifts Smoking-If you must! Product Group: Ash Tray Products Desk Gifts Household Silver Metal Item Products Smoking-If you must! Product Group: Pocket Gifts Smoking-If you must! Product Group: Smoking-If you must! 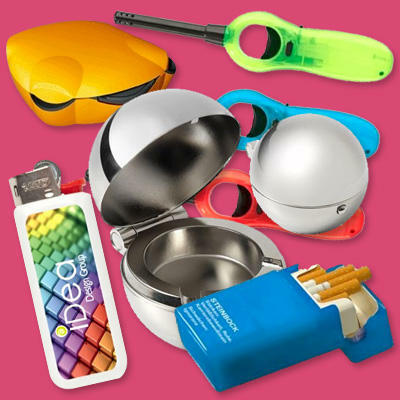 We provide a wide range of promotional smoking gift products and accessories such as advertising match box, ash tray, lighter, metal cigar case, clip case, imperial blue book of matches, ash tray on tripod stand and many more. All these products can be customised with your company name or logo as per your requirements to promote your brand among a large number of customers. Our team of professionals can also help you to choose the perfect promotional item to suit your marketing campaign. On the whole, from ideas to design to printing, we make sure to deliver the best tailored products and services for our clients.